Are you a simple white sneaker kind or girl, or are you more adventurous when it comes to your footwear? If you're in the latter camp, you probably get as excited as we do about updated versions of classic shoes, like Rita Ora's revamped Adidas Stan Smith sneakers or Nike's self-lacing shoes. Now, the latest sneaker overhaul we're obsessed with comes courtesy of Bandier's collaboration with Nike, which features a pair of rose gold kicks we can't wait to get our hands on. The collaboration features shoes and clothes with rose gold touches. For fashion girls, this is music to our ears: You officially don't have to say goodbye to rosé just because it's autumn. Could you really pass up the opportunity to match your shoes to your drink? 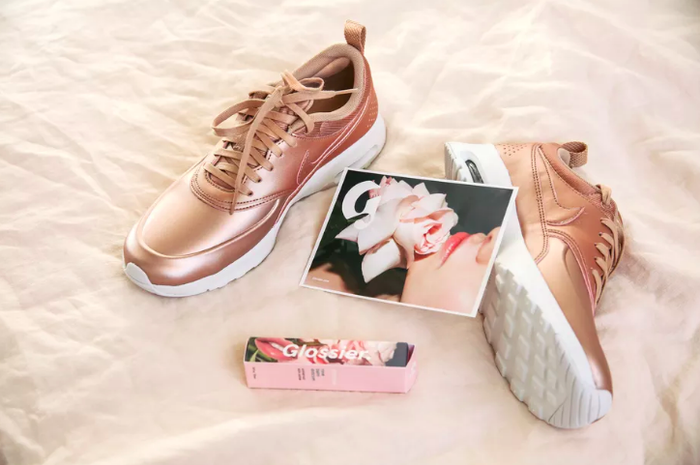 Scroll down to see Bandier's rose gold new collaboration with Nike, and shop the trainers now. Next up! Margot Robbie's £58 trainers are perfect for travelling.